Ever wonder what the soldiers ate during World War I? . . . Well, according to a hundred-year-old magazine, one thing they ate was honey. Honey is being used in the European trenches along with sugar. Both of these articles are energy-producers, and in many cases honey is cheaper than sugar. When the war broke out in 1914 the prices on medium grades of honey began to sag until there was no demand. In the meantime sugar began to climb. The war lords of Europe, when it came to the matter of rations, soon discovered that honey, an energy-producer, was much cheaper than sugar (also an energy-producer), and consequently honey has been going into the trenches, and is going there still. Apparently, only the medium grades are being used, because they furnish as much energy per pound as the finer and better-flavored table honeys that cost as much or more than sugar. I learned something new this morning. 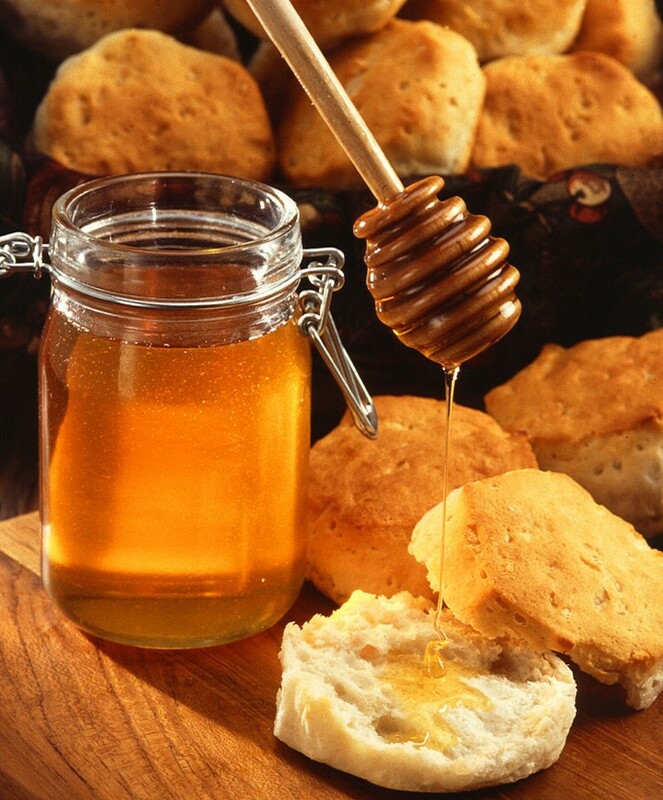 🙂 Honey is so good on biscuits , that picture makes me want one! I tend not to use a lot of honey, but I can imagine it was a real treat in that situation. I suspect that the use of “medium grade” didn’t make a bit of difference, although the flavor might be a little different. It seems to me that it probably is like the grading of maple syrup. A real syrup lover can tell the difference in color and taste, but someone in the trenches wouldn’t care a bit. I agree-“medium” probably has a fairly typical flavor. I’m always surprised by how many different varieties of honey there are – and how much the flavor and color varies across varieties. I don’t have any idea whether honey “grades” and “varieties” overlap – or whether they are two totally different ways of classifying honey. Honey is also a natural antibiotic and doesn’t go bad. It may harden but it is still good. Honey is an amazing food. I think that I read somewhere that archaeologists found honey in Egypt that was thousands of years old and that was still good. I am trying to imagine getting honey to the troops. Did they ship it in jars? Was it from Europe or America? I had similar questions. It was a short article with very little detail. Back then it seems like honey would have been transported in jars or cans. . . or maybe barrels. It wasn’t clear to me which troops were eating honey or where they got it. It was really interesting. I was reading about WWI and the conditions were brutal. I’m glad you enjoyed this post; and, I look forward to seeing your Egypt photos. Another fascinating find. Honey also has natural anti-bacterial elements, which is great. I love it in tea and also peanut butter and honey sandwiches. I don’t think that I’ve ever had a peanut butter and honey sandwich. I’ll have a give it a try. Lucky them! I can’t find any evidence that British Tommies got honey. Jam, sugar and condensed milk were their sweet treats. Similarly to the British troops, I think that canned condensed milk was widely used by US troops during WWI and II. My husband still uses his homey and I just asked if he got the habit from when he served., but he does not remember. He just uses if for a medicinal attribute and its delicate sweetness.. We are honey people and it is delicious. Some people we know are allergic to certain kinds of honey. Not us, any of you? There is something I read that if you aadd lemon to the honey you’ll get a g great night’s sleep. I think so. I know people who swear that honey can cure various health issues. They believe that certain varieties are particularly good for certain ailments. Like you, I’ve heard that a glass of warm water with honey and lemon is good for getting a good night’s sleep, but I’ve never personally tried it. I can’t even imagine a time when there was no demand for honey, ❤ it and interesting to know this bit of history. I’m wondering if honey seemed just a tad “old-fashioned” a hundred years ago. Great post. It’s perfectly fitting tribute for this day of remembrance. I didn’t know about the honey in the rations. That’s interesting. Your biscuits and honey looks mighty tasty. Thanks for the kinds thoughts. I had a lovely day. I hope that you also have a wonderful week-end. Great to know about this piece of history! Intriguing. I don’t think New Zealand troops got honey. Not in field rations, at least. It would be interesting to compare the field rations of troops from various countries. Yes! My father has talked about the difference between the NZ rations and the US rations in WW2. and is that your image? Beautiful! I agree. It’s a beautiful image, but I didn’t take it. You can see the attribute for this picture if you hover over it. I got it from Wikimedia Commons, and according to that website, it’s in the public domain. Wikimedia Commons says: “This image is in the public domain because it contains materials that originally came from the Agricultural Research Service, the research agency of the United States Department of Agriculture.” It was taken by Scott Bauer, USDA ARS. Perhaps they also knew that if you mix together honey and salt, it was a disinfectant to pack into open wounds until they could be treated. I learned this trick by reading up on Royal Navy history for an upcoming novel. That’s really interesting. I learned something new from your comment.